Due to our Christmas / New Year holidays ,all orders placed on or after 19th Dec will be processed when we return 7th Jan 19. Have a very Merry Christmas and a Happy New Year. Our aim is to offer a fast and reliable delivery service, so that you get your goods when you need them. We currently offer a FREE delivery service to the UK Mainland for orders over £25 exVAT and only £4.99 for orders under £25 exVAT. We also offer services to areas outside the UK which are detailed above. We typically send orders that weigh under 2kg via Royal Mail and orders over 2kg are sent using a carrier service (such as DPD, UPS and TNT) and will require a signature of receipt. When your order is dispatched you will receive an email notification including details of the carrier that your goods will arrive on and a tracking number where available that you can use to check the progress of your delivery. Orders to the UK Mainland will take 2-4 working days, but we manage to get most orders to our customers within 1-2 working days. If you need Next-Day delivery, please contact us for a quote as this service is available for many of our items. While we list our items in pack quantities, we will package multiple orders of the same item in the same packaging. 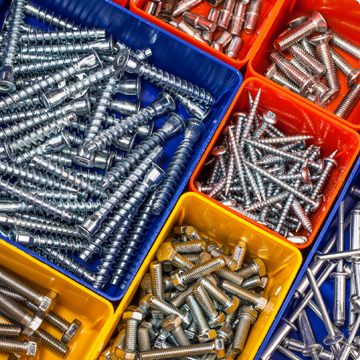 For example an order of 10 x 100 wood screws might be dispatched in a package of 1 x 1000 wood screws. The reason we do this is so that we can keep delivery costs down. If you require your items to be supplied in the pack quantities they are listed in, please contact us either prior to or immediately after your order is placed and we will ensure they are delivered correctly. As mentioned above, in areas outside the UK Mainland we may have to apply an additional surcharge to your order to cover the extra cost of delivering bulky, heavy or special items to your area. In this scenario we will contact you via telephone/email immediately after your order has been placed to discuss the available options. On some occasions when an item is out-of-stock, ordered in bulk quantities, or a quick delivery is needed, we may arrange to have your goods delivered straight from our supplier/manufacturer. Please contact us as soon as possible to arrange your return so that we can issue you with a returns note to include with your goods.